Trust is good – but measuring is better! For years CS Instruments GmbH has been one of the worldwide leading manufacturers of measuring technology for the compressed air and gases. Long-term experience in production, supply and drying of compressed air is contributed to the research, the development and the production of portable and stationary measuring instruments. 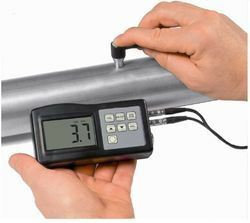 This results in practicable measuring instruments for compressed air like e. g.: Dew point meter, Pressure dew point meter for refrigeration / adsorption dryers (according to ISO 8573), Compressed air counter, Consumption counter for compressed air and gases, Flow meter, Leakage measuring instrument, Leak detector, mobile analysis of compressed air stations. Compressed Air and Gas Flow Meter. Compressed Air Particle Measuring Instruments. 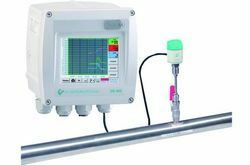 Ultrasonic Flow Instruments for Air or Gas. 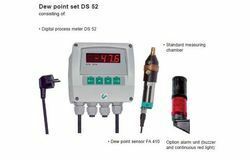 Dew Point Sensors and Instruments for COmpressed Air. Dew Point Hand Portable Measuring Instruments. 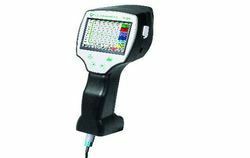 Dew Point Monitor for Compressed Air and Gas. 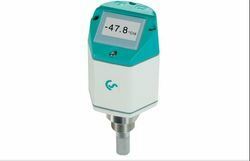 Dew Point Sensor with Digital Display Like Testo. 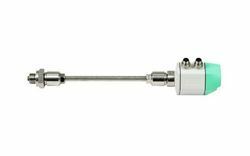 Dew Point Sensors for Ex and Atex Applications. Particle Counter for Compressed Air. Particle Monitoring for Compressed Air. 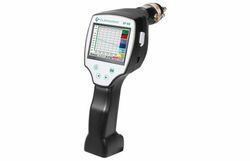 Hand Portable Particle Counter for Compressed Air and Gas Lines-Like Testo. Air and Compressed Gas Flow Station to Save Energy. Software for Compressed Air and Gas Monitoring. 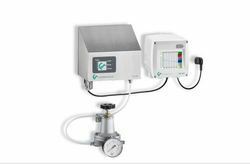 The VA 400 for consumption measurement of compressed air and gases in a robust housing with actual consumption in m³/h and counter in m³. helium, CO2, oxygen	Accuracy: ± 4 % m.v. For more information send us an e mail. The graphic indication of coloured measurement curves is inimitably. Up to 100 million measured values can be stored with date and name of measuring site. The measured values can be transferred to the computer by means of a USB stick. compressed air and gases especially in closed circular pipelines. By means of VA 409 with flow direction indication the flow direction of the compressed air can be determined quickly and safely. Compared with the former mechanical paddle flow switches VA 409 is able to detect even the smallest changes in the flow direction quickly and without any mechanical movement. 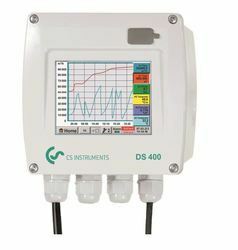 consumption sensors VA 400/VA 420 or to a separate building management system (mbs). Two LEDs show the flow direction. The leak detector LD 400 is a handy device for detecting often hidden perforations in pipes and tubes. It is the further development of the proven LD 300 and impresses through a significantly more sensitive sensor technology to provide improved support during the leak detecting process. Plus, the design has been revised in accordance to modern criteria for ergonomics at the workplace and the LD 400 is much more compact and easier to manage than its predecessor. Leaking gas causes ultrasonic noise. However, a leak must have the size of approximately 1 mm and the pressure must have reached approximately 7 bar before the frequency emits a sound that is audible to the human ear. The leak detector LD 400 can locate leaks in the ultrasonic range, even from a distance of several meters. The LD 400 translates the ultrasonic sound into an audible frequency and makes it easier to detect even the finest holes in the pipes. 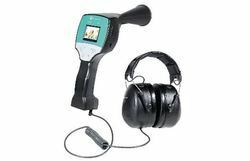 Sound-proof headphones ensure that the technician can hear the acoustic signal even in the noisy environment of an industrial plant. Additionally, in extremely loud rooms, we recommend the use of a shotgun microphone with a directional tip. It functions like a directional microphone, prevents annoying background noises and also facilitates the precise localization of leaks in inaccessible areas. 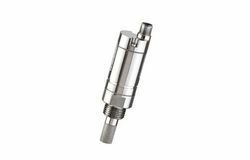 Additionally, an ultrasonic transmitter whose signal penetrates through the smallest openings can be used to detect leaks in pressureless systems. With the Atex approval for Zone 1 the established dew point measuring instruments FA 300-2 can now be used in explosive areas of the industry as well. U0 = 30 V max. I0 = 100 mA max. P0 = 1 W max. 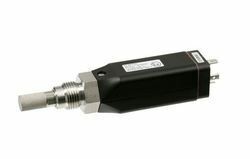 The ideal dew point sensor for the monitoring of refrigeration dryers with analogue output 4…20 mA. FA 410 FA 410 from -20 to 50°Ctd - the ideal dew point sensor for monitoring membrane dryers. 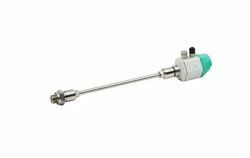 The dew point sensor FA 410 is extremely long-term stable and can be installed and removed quickly and easily under pressure by means of the screwable measuring chamber including quick-coupling. The dew point set is supplied ready for plug-in, i. e. everything is completely wired. The alarm values can be freely adjusted. Precise dew point measurement down to -80°Ctd. Ideal for documentation of the measured values/measurement curves on site. Coloured measurement curves can be sent by e-mail or integrated into a service report. By means of the photo key the “current screen” can be stored as an image file and printed out at the computer or edited without any additional software. In the past mini thermo transfer printers were used frequently. The lifetime of the printout is temporary and it cannot be used in the computer. Therefore the printout was glued onto a paper very often. It replaces the worldwide proven instrument FA 200. The threshold value can be easily adjusted via the keypad. For fast and easy checking of pipes for fitting air flow meters. Our long-term hands-on experience in measurement and control technology was implemented in the new DS 400. From recording of the measured data, automatic sensor identification, indication on a big colour screen, alerting, storage up to remote read-out via web server, all that is possible with DS 400. By means of the CS-Soft, software alarms can be sent via SMS or e-mail. On the big 3.5' colour screen with touch panel all information is available at a glance. The operation is very easy. All measured values, measured curves and threshold exceedings are indicated. The progression of the curve, since the beginning of the measurement, can be viewed by an easy slide of the finger. The huge difference to ordinary paperless chart recorders reveals in the easy initiation as well as in the evaluation of the measured data. All sensors are identified directly and powered by DS 400. Everything is matched and tuned. RS 485, Modbus RTU and SDI. Network-compatible and worldwide remote data transmission via Ethernet, integrated web server. Up to 4 threshold values can be configured freely and allocated to 2 different alarm relay. Collective alarms are possible. Our long-term hands-on experience in measurement and control technology was implemented in the new DS 500. From recording of the measured data, automatic sensor identification, indication on a big colour screen, alerting, storage up to remote read-out via web server, all that is possible with DS 500. By means of the CS-Soft, software alarms can be sent via SMS or e-mail. On the big 7' colour screen with touch panel all information is available at a glance. The operation is very easy. All measured values, measured curves and threshold exceedings are indicated. The progression of the curve, since the beginning of the measurement, can be viewed by an easy slide of the finger. 3, for each consumption sensor are completing the sophisticated system concept. The huge difference to ordinary paperless chart recorders reveals in the easy initiation as well as in the evaluation of the measured data. All sensors are identified directly and powered by DS 500. Everything is matched and tuned. Up to 32 threshold values can be configured freely and allocated to 4 different alarm relay. Collective alarms are possible. 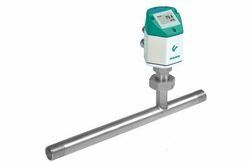 Oil Vapour Measuring Unit with Probe for Compressed Air. Residual Oil Vapour chacking in compressed air. Helps to identify oil in compressed air from 0.1 micron and saves damage to filters due to perforations. The PM532 is a mobile power and energy measurement device for large consumers such as air compressors. All components are housed in a rugged, splash-proof plastic case. 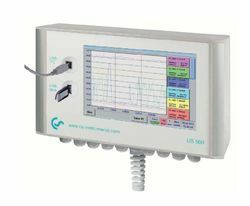 The PM532 measures currents and voltages of the connected consumer and calculates the performance as well as the energy consumption. The measuring case can be easily connected to the 32A supply line of consumers. For a 16A supply, optional adapters are available that allow you to connect to the built-in 32A CEE socket outlets. The unit is designed for measurements in the 3-phase power range with up to 32A, wherein the current path will not be additionally secured with a fuse through the measuring kit. It is assumed that the existing installation has a corresponding fuse protection. The PM532 has three 230V power outlets that are each assigned to one of the three phases. Thus it is possible to also determine the power consumption of external consumers. The measured values can be read directly from the display. In addition, the most important measurement values can also be queried through the internal RS-485 interface via the Modbus protocol. Looking for Instruments for Compressed Air and Gas ?